AUSCS: A strong government school system is necessary to protect the weak masses from the powerful corporations. The conservative Americans United for the Synchronization of Church and State launched an anti-voucher policy offensive this week in a mass-mailing to supporters throughout the country. The organization says it is worried that offering school choice will hinder their ability to teach religion to young children and to protect children from dangerous influences. 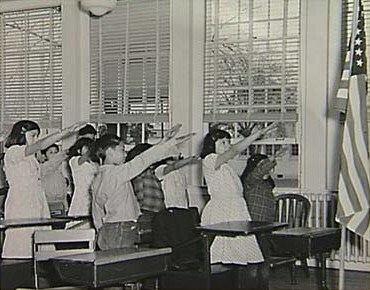 The right-wing educational activist said that most parents prefer that their children learn basic skills in school—reading, writing, mathematics, history—and that the only way to force all children to pray or to take part in classroom devotions is if parents have no choice about where to send their children. A public school teacher openly promoted creationism in science class and even used an electronic device to burn crosses onto students’ arms. Public school officials led students in prayer and invited clergy into the classroom for religious devotionals. A public high school featured an official student creed in its handbook which included religious affirmations. AUSCS voucher plea last modified December 16th, 2012. Copyright © 2019 Leni Films.